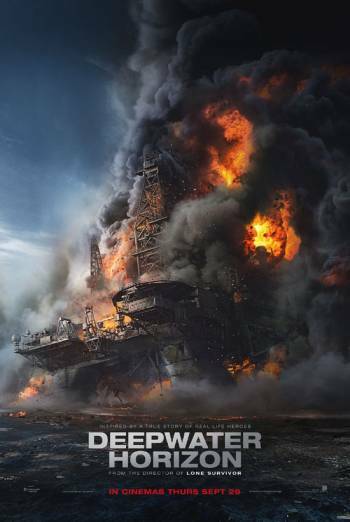 Summary DEEPWATER HORIZON is a drama, based on real events, about an explosion aboard an oil rig in the Gulf of Mexico and the subsequent rescue of survivors. DEEPWATER HORIZON is a drama, based on real events, about an explosion aboard an oil rig in the Gulf of Mexico and the subsequent rescue of survivors. There are a number of scenes of moderate threat as explosions rip through the oil rig, with workers being enveloped by flames and hit by flying debris. There are some images of bloody injuries, most notably a scene in which a man's broken leg has to be manipulated to free him from twisted metal, and a shot of a man pulling broken glass and shards of metal from his feet. There is a single use of strong language ('f**k'), which is used purely for emphasis rather than as a threat or insult.